How Partisan is Congress (Part 1)? A few months ago (at the height of the fighting and deadlock over the national debt ceiling), I decided to investigate how partisan the United States congress really is — that is, how often do congresspeople vote along strict party lines. Perhaps I’m naive, but I find it frustrating that politicians seem so much less willing to compromise than other groups of people. I would prefer a government where concern for the common good takes priority over the culture wars. With the 2012 elections approaching, I wanted to get a better handle on how willing different congresspeople are to compromise. Fortunately, the congressional voting history is public, and govetrack.us provides convenient access to both browse and download these data. Calculate the ‘net’ party vote for each of these. A value of 1 indicates a party is unanimously in favor of a motion, bill, etc. 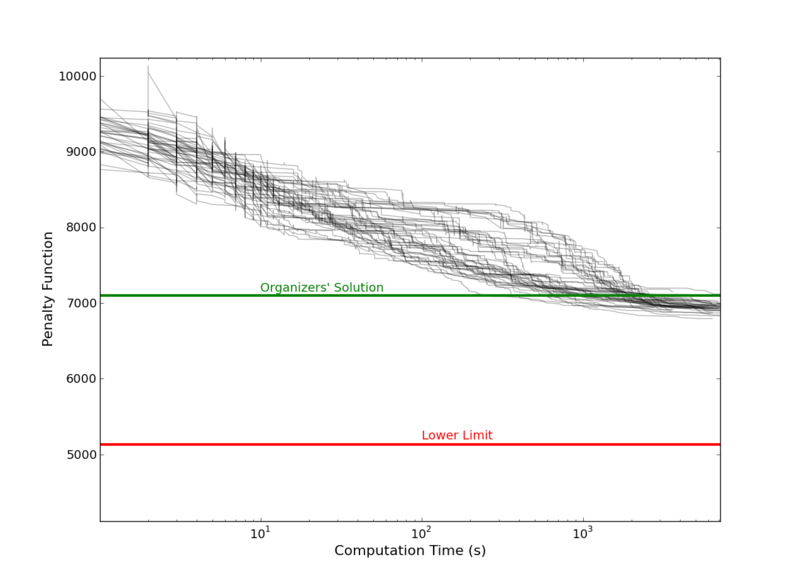 A value of -1 indicates unanimous disfavor. A value of 0 indicates a deadlock, with half of the party voting yes and no. 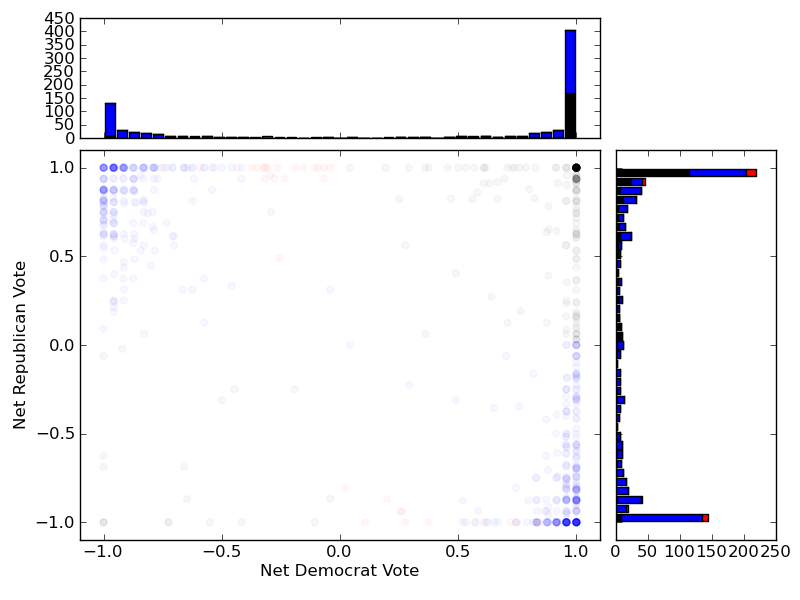 Compare the net party votes for each party. Each colored circle represents a single motion, bill, etc. The x/y locations give the net party vote for democrats/republicans. The color of the circle indicates, in cases where the majority opinion for each party differs, which party won (red=republican, blue=democrat, black= agreement among both parties). So, for example, all points in the upper right and lower left corners are black, since both parties agreed on a yes or no vote. 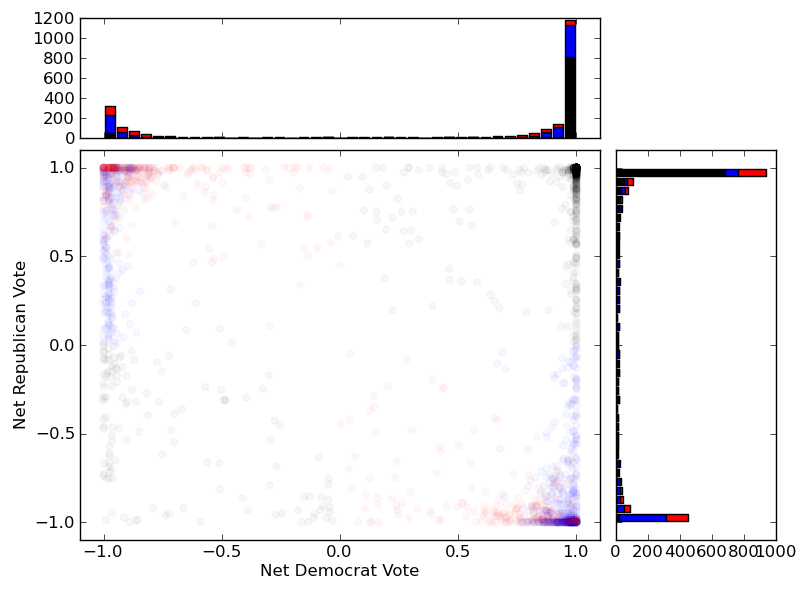 The upper left and lower right corners are regions of disagreement between the parties.The histograms show the overal distribution of democrat (top horizontal graph) and republican (right vertical graph) votes, again color-coded by which party won the vote. Very many votes are (nearly) unanimously accepted by both parties. I found this to be refreshing, as it suggests that Washington is not as deadlocked as the news may imply. Of course, many of these motions are hardly controversial. Take the title of one such resolution, passed in the House by a vote of 421-2: “On Passage – House – H.R. 2715 To provide the Consumer Product Safety Commission with greater authority and discretion in enforcing the consumer product safety laws, and for other purposes – Under Suspension of the Rules.” A good next step would be to filter out the most benign / procedural votes, to better see ideological divides. The votes for both parties are clustered around unanimous support or rejection, with few points near the center of the graph. I wish there was more disagreement within each party — dissenting opinions generally seem like a good idea.